We set out for the coast later than planned. Deb and I arrived at the car rental place in downtown Melbourne at 10 a.m., as requested, but the line for the second-floor office went all the way down the stairs to the street. Ned showed up with his backpack and rolled a cigarette and stood outside with me in the strong sun until Deb emerged over a half hour later with the keys to our blue Holden Cruze with New South Wales plates. We crept through the city where pedestrians had taken over the Saturday morning streets, and after three years in this country, Deb did her first stint of driving on the left, in busy CBD traffic, no less. A couple of hook turns later we were heading out of town. (A hook turn is a right-hand turn in which you sit in the far left lane until the light turns red, then cut across all lanes of cars, trams, and bikes to make your right… It is counter-intuitive and nerve-racking, I can attest from sitting beside her). We made it to Kim’s southwestern neighborhood and collected her, and we were on our way. The city soon fell away to rolling brown land (and “severe” fire risk posted every few kilometers) and the sensation of getting closer to the sea. One of our first stops was a golf course known for its kangaroo sightings. Apparently they like to graze on the green. We saw the signs asking people like us not to wander onto the course in search of kangaroos. We took a look about but didn’t see any, so we continued on our way. A picnic, it was decided, and Deb and I went in the grocery store looking for take-out sushi but found nothing, and Ned and Kim came up empty-handed as well. We ended up back in that first café, and a table emptied out so we took their stools and plopped down at the table, thoughts of a picnic no longer on our minds. “Sorry,” said Kim. “I can’t stand indecision. I’m going to do that if I see us waffling again.” We all agreed it was helpful, and we each fell into our respective roles, Deb the driver, Kim the decider. Ned the smoker. Me, the interloper in this band of work mates. Back in the car, we made our way along the coast. 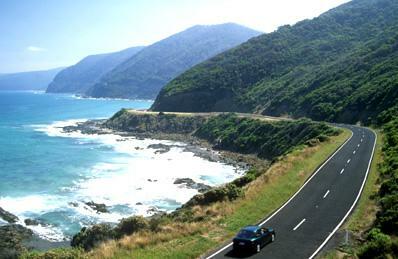 Soon we were officially on the “Great Ocean Road,” aptly named. Much of the time it skims the edge of the coast and you can see surfers down below riding the cerulean waves. We spent the night in Lorne at a classic-looking hotel on the point. Kim took a nap, Deb and Ned wandered off to the beach, and I headed to the pier to watch teenagers dive off the pier into the water many feet below. It made my stomach flutter just watching them pitch themselves into nothingness. Others were fishing off the pier into the clear waters below. I made my way back to the café outpost at the end of the pier and set up with yet another coffee and my book and read Bill Bryson about his travels across Australia, and imagined that he was my travel companion filled with stories about the jellyfish and sharks and crocodiles and spiders and all the ridiculously poisonous creatures lurking about the coast. Seeing no such dangers I walked down to the shore line and enjoyed the rocks and the water splashing among them. When I got back to the hotel I found the others were back and awake, and we opened the supplies we’d picked up coming into town, cheese and salami and crackers and sparkling wine. We sat on our porch and looked out at the sea. We walked into town before the sun set and saw a small group looking up into one of the trees by the side of the road. We joined them and saw a good-sized koala bear reaching out to pull off eucalyptus leaves and munch on them. He moved up a branch after we arrived, but we were able to crane our necks and see him looking back down at us for a few minutes before we walked the rest of the way in to watch the surfers and order up some Asian noodles. The next day we checked out and continued west, and the road followed the curves of the coast. We stopped for breakfast in a coastal town facing the water, and the coffee took the edge off the instant coffee we’d made back at the hotel. We bombed across the southern tip of Australia, turning off the air conditioning so Deb could roar up the hills past slower cars. The first few hours were still in the shadow of Tasmania, and the waves were soft and rolling. Once we came to the other side of the point the surf picked up noticeably, and the foam on top of each wave was menacing and powerful, though the turquoise underneath suggested placid tropics. 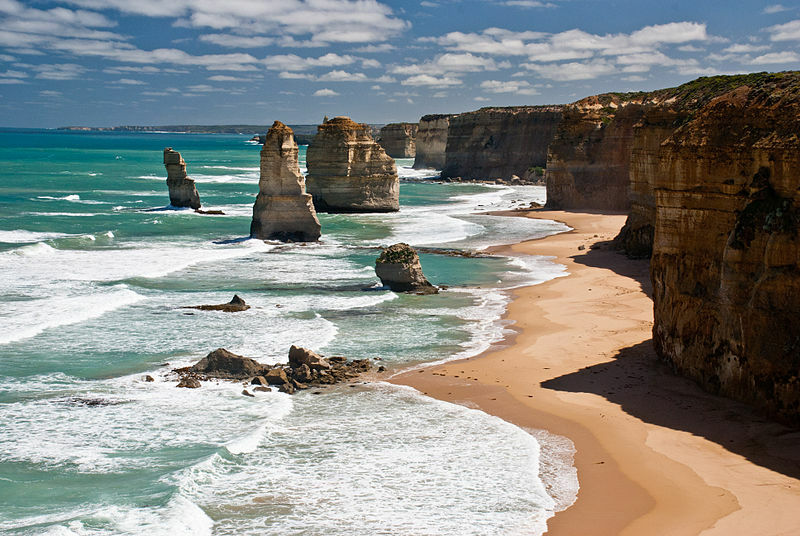 Twelve Apostles, along Great Ocean Road. Photo credit: Richard Mikalsen. We made it to the Twelve Apostles, limestone outcroppings eaten away by the water. Where we stood will one day be future Apostles, lonesome towers of rock slowly nudged off until they crumble into nothingness in the surf. Helicopters swooped by overhead, where tourists chose to hire a driver to lead them out over the water to catch a glimpse of them against the shore. We asked a young Asian man if he would take a picture of our foursome, and he agreed with a “No worries.” He asked where we were from; we told him the States, and Kim was from Canada. Kim asked where he was from and he told us “China.” We were all somewhat startled because he sounded as unaccented as us. “You speak very well English,” said Kim, who immediately wished to eat her words; thinking too hard about language, one makes foolish mistakes in the native one. They wrapped up the conversation and he went on to rejoin his family, and Kim hid her face and dissolved into giggles at her mistake. Deb told her how she came up with ridiculous statements when giving a presentation in French-speaking Canada, sounding more like Yoda than a businesswoman. And I was reminded of my own attempts in German, in one case around a table after a row where I said, “Entschuldigung, mein English ist nicht so gut,” not realizing my own error until a German man replied in a thick accent, “I think your English is just fine…” Why, why do our brains get so addled in other languages? Even just thinking about the magnitude of effort in learning a language is enough to make you mangle the one you actually know. It’s best not to think too hard about any of it, but even that effort is too self-conscious to loosen the tongue. We drove back across the bush lands, brown earth and dust rising from the side roads, past herds of cows, horses, and goats on the farms along the way. The driver had the hardest job. Deb had to navigate the winding road and resist the temptation to look out at the jaw-dropping scenery. She had to stay alert across the bush while the rest of us gazed out and dozed off. No rest for her. Getting back into the busy streets of Melbourne when the sidewalks were still clogged with summer-happy pedestrians, she had to face the perils of city driving and hook turns yet again. I couldn’t offer much by way of navigation, and I held my breath as she hugged a turn and hit the curb. It messes with your mind, driving on the left, and I can’t fully appreciate how confounding it is other than experiencing Deb’s mounting anxiety and clear relief when she parked it in the underground lot and handed the keys to the attendant. She showed me a blister she’d developed on her right hand on our short journey, from turning the wheel back and forth so many times on the windy Great Ocean Road. I almost showed her the blisters I’d gotten on my rows on the Yarra but thought better of it. Let the girl relax. Get her onto the tram, back to her place; pour her a glass of wine. Turn on the Olympics. That was her weekend, leading the pack, right into Sunday evening. Monday morning and work with its myriad demands awaits. This entry was posted in History and culture, Travel - Beyond Berlin and tagged Great Ocean Road, Lorne, Melbourne, road trip, Torquay, Twelve Apostles, Yarra River on February 10, 2014 by Jill M..